For the third movie in the Captain America series, we head to 2016’s Civil War. After the mayhem that occurred during Avengers: Age of Ultron and a separate event that causes an international incident, politicians push for measures that will regulate superheroes and ostensibly rein in their potential excesses. These developments lead to a rift among the Avengers. Partially due to feelings of guilt for the damage involved, Tony “Iron Man” Stark (Robert Downey, Jr.) thinks that the heroes should go along with the governmental restrictions. On the other hand, Steve “Captain America” Rogers (Chris Evans) believes that the heroes should be able to make decisions for themselves and not submit to the limitations enacted by a supervisory body. With two leaders at odds, the other heroes need to choose sides. This leads toward literal internecine warfare, as the Rogers and Stark factions deal with each other. 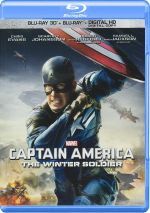 In addition, Steve’s old buddy Bucky Barnes (Sebastian Stan) causes more threats as the “Winter Soldier”, and Cap tries to protect him, all while he deals with external issues. As my reviews indicate, I’ve been somewhat lukewarm toward the two Avengers movies, but I really liked the prior Captain America flicks. 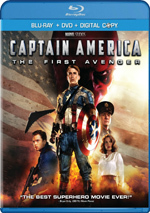 2011’s First Avenger remains the best of the pre-Avengers efforts, and 2014’s Winter Soldier stands as the strongest of the batch that came between Avengers and Age of Ultron. Logically, this means I should enjoy Civil War, and I do – a lot, in fact. This surprises me for one reason: Civil War essentially offers Avengers 3, not Captain America 3, as it shares a whole lot of connections to the Avengers series. As much as I like Civil War, I must admit that I wish Marvel didn’t feel the need to include multiple heroes in every one of their movies. Oh, I think “hero cameos” can be fun – such as the short Falcon sequence in Ant-Man – but single-character movies should keep the guests to a minimum. The Avengers flicks offer a great way for different roles to interact – why water down their impact with other efforts that follow the same template? And make no mistake: as I noted, Civil War really does give us Avengers 3. In addition to Cap and Iron Man, the movie makes use of the Vision, the Scarlet Witch, Black Widow, the Falcon, War Machine, Hawkeye and others whose identity I’ll keep secret rather than offer potential spoilers. In the end, this means a good ten heroes who feature at least moderately heavily in Civil War. Can someone explain to me how this allows the film to differ from an Avengers adventure? Just because Hulk and Thor fail to appear? I leveled the same criticism at Winter Soldier, as I felt it made its nominal star feel too tangential at times. Civil War does even more to diminish the prominence of its title character – while Cap does feature prominently, he still doesn’t get the level of attention he deserves. All this carping aside, I really do like Civil War - it might be an Avengers movie at heart, but it’s a really good one that tops the two “real” Avengers films. The film achieves a depth and balance that fails to occur during those efforts. Despite my references to Civil War as Avengers 3, it boasts crucial links to Winter Soldier. In particular, it brings back Winter Soldier directors Joe and Anthony Russo as well as writers Christopher Markus and Stephen McFeely. I suspect the work of these men allows Civil War to fare better than the Avengers movies and not feel just like another tale in that series. Coincidentally, Civil War explores themes dealt with in Batman v. Superman: Dawn of Justice, as that flick also looked at the real-life ramifications of massive mayhem. However, Justice did so in a fairly tepid manner, whereas Civil War brings actual drama to the notion. Most of the movie addresses these topics and the film does so in a manner that seems surprisingly rich for a big action blockbuster. Add to that good character development and Civil War boasts a three-dimensionality rare for movies of this sort. Don’t mistake that to mean Civil War skimps on action, though, as it provides a lot of vivid set pieces. In particular, a big hero-on-hero fight gives us a terrific sequence, and the climactic battle soars as well. Though less broad, this sequence amps up the personal stakes and delivers a dramatic conclusion to the film. I admit I’ve never bought into the “Marvel Cinematic Universe” as much as I’d like, but I do really enjoy the Captain America films, and Civil War arguably becomes the best of the bunch. The Russos will direct the next Avengers movies – after Civil War, I can’t wait to see what they do with the series. Footnote: just like every other Marvel movie, Civil War includes tags after the film’s conclusion. Here we find both mid and end credit bits, so stick around to the very finish. 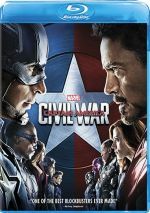 Captain America: Civil War appears in an aspect ratio of approximately 2.40:1 on this Blu-ray Disc. This became a positive presentation. For the most part, sharpness looked solid. I thought a few wider shots appeared a little soft, but those remained minor, so the majority of the flick came across as accurate. Neither jagged edges nor moiré effects created concerns, and I witnessed no signs of edge haloes or print flaws. Like most modern action flicks, Civil War opted for a teal and orange orientation. These tendencies didn’t overwhelm, but they dominated, and the movie displayed them in an appropriate manner. Blacks came across as deep and firm, while low-light shots presented clear imagery. The movie brought us a solid transfer. As for the movie’s DTS-HD MA 7.1 soundtrack, it delivered the expected dynamic material. With tons of action, the soundscape used all the channels on a frequent basis. This led us to an exciting sonic experience from start to finish. The various speakers provided lots of information that filled out the movie and blended together in a seamless manner. Bullets, explosions, vehicles – you name it and it blasted all around us. This formed a dynamic soundfield with a lot to offer. 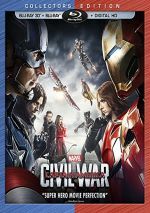 This package includes both the 2D and 3D versions of Civil War. The technical comments address the 2D edition – what does the 3D platter bring to the table? In terms of quality, the 3D image seemed fairly good, if not as strong as the 2D version. The 3D presentation came across with a little weaker definition, but not to a substantial degree. It also appeared a bit darker, a factor that often occurs with 3D images. Though not quite as appealing as the 2D, the 3D looked positive. As for the 3D imagery, it tended toward a general sense of depth without a lot of “wow” moments. I don’t view that as a bad thing – I don’t want gimmicky “in your face” nonsense – but I also can’t claim that the 3D elements added much to the film. The movie’s big hero-against-hero sequence probably benefited the most, as it gave us a sense of pizzazz that brought zip to the film. Otherwise, though, I’d be hard-pressed to point out any parts of the movie that used the 3D in a particularly involving manner. I liked the 3D version but didn’t think it created an obvious improvement over the 2D presentation. Note that the aforementioned major action sequence offered one change from the 2D disc: a different aspect ratio. Shot on digital IMAX cameras, the hero-on-hero fight opened up to 1.90:1 on IMAX screens, and it did the same here – but only for the 3D version, as the 2D presentation remained 2.40:1 the whole time. That gave the 3D rendition an edge. When we look at the set’s extras, we open with an audio commentary from directors Anthony and Joe Russo and writers Stephen McFeely and Christopher Markus. All four sit together for this running, screen-specific discussion of story/character areas and influences/inspirations, stunts and action, cast and performances, sets and locations, various effects, music and editing, and connected subjects. This foursome of filmmakers did a terrific commentary for Winter Soldier, and that winning streak continues here. Given the personnel, we get an emphasis on story/screenplay/character domains, and we locate plenty of great insights there. Other topics flesh out the piece and help it become informative and enjoyable. Under the banner United We Stand, Divided We Fall, two featurettes appear. Together these last 45 minutes, 43 seconds and offer details from Anthony and Joe Russo, McFeely, Markus, producer Kevin Feige, Marvel Studios co-president Louis D’Esposito, fight coordinator James Young, executive producers Victoria Alonso and Nate Moore, stunt coordinator Stan Hargrave, prop master Russell Bobbitt, head of visual development Ryan Meinerding, visual effects supervisor Dan DeLeeuw, and actors Chris Evans, Robert Downey Jr., Anthony Mackie, Sebastian Stan, Frank Grillo, Elizabeth Olsen, Paul Rudd, Jeremy Renner, Scarlett Johansson, William Hurt, Don Cheadle, Paul Bettany, Chadwick Boseman, Daniel Bruhl and Tom Holland. “Fall” looks at story/character areas and connections to the other Marvel films, cast and performances, the Russos’ impact on the production, stunts and action, sets and locations, costumes/effects, and related topics. Though somewhat breathless in tone, “Fall” still manages to cover a good array of subjects. We find a solid mix of insights in this useful pair of programs. Two more pieces pop up under The Road to Civil War, as we find “Captain America” (4:11) and “Iron Man” (4:27). Across these, we hear from Joe and Anthony Russo, Evans, Downey, Feige, and Moore. The segments offer general thoughts about the characters in question. Both feel fairly superficial. More of a promo than a featurette, Open Your Mind goes for four minutes, two seconds and offers an “exclusive sneak peek” at November 2016’s Doctor Strange movie. The program gives us remarks from Feige, director Scott Derrickson, executive producer Stephen Broussard, and actors Benedict Cumberbatch, Chiwetel Ejiofor, Benedict Wong, Mads Mikkelson and Tilda Swinton. Don’t expect anything more than a long advertisement. Four Deleted and Extended Scenes go for a total of seven minutes, 52 seconds. We find “Extended Peggy’s Funeral” (5:57), “Zemo Meets Doctor Broussard” (0:33), “’You Are Not Used to the Truth’” (0:53) and “’Gotta Get Me One of Those’” (0:19). As the longest sequence, one might expect major changes for “Funeral”, but it doesn’t do a whole lot to alter the existing scene; it throws out short expository beats but nothing major. Of the other three, “Truth” adds a little to a new character and becomes the most worthwhile of the bunch. The other two lack much to them. Finally, we get a two-minute, 53-second Gag Reel. It delivers the usual roster of mistakes and laughs. It’s nothing much but it’s short enough that it doesn’t wear out its welcome. The disc opens with ads for Doctor Strange and Marvel: Contest of Champions. No trailer for Civil War appears here. With the third film in the series, Captain America: Civil War offers another winner. Rich, exciting and dramatic, the movie continues the franchise well. The Blu-ray delivers very good picture and audio along with supplements highlighted by a strong commentary. Civil War becomes a top-notch superhero adventure.